Or really, I just gave my fanlistings collective a new layout. Yeah, I'm aware you shouldn't mix primaries, but it seemed like a good idea at the time. Anyway, I wanted to try making a layout with comics, which is something I've never done before! It turned out to be like making a layout from any other sort of images. Plugging: forblueskies, oleandergirl's latest domain. Man, I really want a personal site again...I even have a name picked out. Too bad I've become the world's worst at keeping sites updated, eh? No, I didn't know, it looks great & I'll be updating all my links when I next get the chance. You've been visiting my sites since CynAth? God, I'm embarrassed. Love eeeet (especially the new luca linkage button). Hahah, I thought you would like that part. I have a desire to go through all my network type sites and make similar Luca-themed buttons now. I used to buy domains all the time...I had like 5 lol and they all sounded the same and started with A. Not sure what this has to do with anything, except that owning more than one can be a pain if you're lazy. You know, it took me a few minutes to realize that it was Dr. Strange up there! I never really saw him from that angle, but I noticed the embroidery on cape seemed familiar. He's a peculiar character, fighting Death and all. 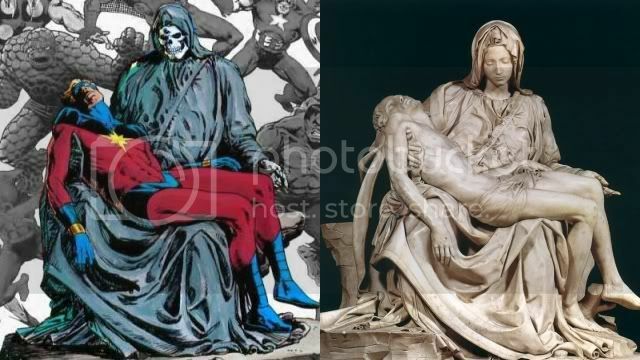 My previous English teacher had this running joke about Captain Marvel's mother being Death due to some picture he saw. Ahaha, I'm getting off track again. But in all honesty, I those colors are amazing, despite the primary colors business you speak of. I'm such a sucker for that color combination, even though I can't use them very well (actually, it just might be the yellow that doesn't cooperate). The header is especially awesome, with those technicolor dots! Red/Yellow/Blue? Hahaha, I am pretty sure my original idea required more green and magenta, but this is what turned out. Yellow is hard just because it's difficult to see/read on, and it's not something most people expect, but I think it's fun. But then, I like every color. Haha, I'm not quite sure, but I did manage to go asking around to get a hold of this image. It looks more like a cheap joke, and I'm not sure if I should laugh or not? But the image was official, according to my friend. The red-yellow-blue thing reminds me of... Superman? But I went to Six Flags recently and bought a cape, so that's probably why. Yellow against a white background is difficult, but you don't have that, so you're okay =) For me, reds are the hardest. Thanks so much for the plug! And no, I believe I hold the title of world's worst at keeping sites updated. hehe. Hopefully I'll do better this time around. Yeah, my new domain is valiantknife.org! I got tired of everything starting with a, lol. Well, I'm definitely giving you a run for your money, in any case. But damn if you aren't adding a new skin everytime I check up on your domain, lol. And I actually see the constant new themes as a bad thing.... indecisiveness be damned! Zomg. You make me want to eat rainbows *____________*! That's like, the best compliment I've ever gotten. If only I weren't lazy! I have all my files from my old one still saved. So it might happen.